This is the 100th post on this blog. If you’re a lurker who hasn’t popped up and said hello in the comments section before, please do – it’s always good to feel that people I’m not related to read this! It would not be an exaggeration to say that a large part of our reasoning behind going skiing every year in Heavenly, on the California/Nevada border at South Lake Tahoe, has to do with the presence of the very best sushi restaurant I’ve ever been to. A disclaimer here; I have never been to Japan. I have, however, been to cities all over the world boasting large Japanese populations, and not one of them has been able to serve me sushi this good. 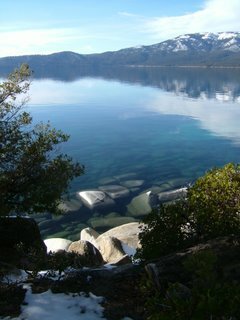 Lake Tahoe (as clear, clean and blue as it looks in these pictures) is about 200 miles from San Francisco and its enormous fishing docks. Samurai Restaurant (2588 Highway 50, South Lake Tahoe, CA, 530-542-0300) is insistent on the freshness of the fish served – as it says on the menu, if it’s not fresh, they don’t have it. This means that on certain days not everything on the menu will be available, but the choice offered is enormous, and whatever is available is guaranteed to be excellent. The owner, prides himself on the restaurant’s Japanese chefs, all trained for years to produce perfect bullets of rice, seasoned with vinegar he prepares himself, and topped with perfectly cut, perfectly fresh fish. The waiters and waitresses bend over backwards to help and answer questions about the food, and the restaurant itself is a little oasis of quietly decorated peacefulness on the busy Highway 50. 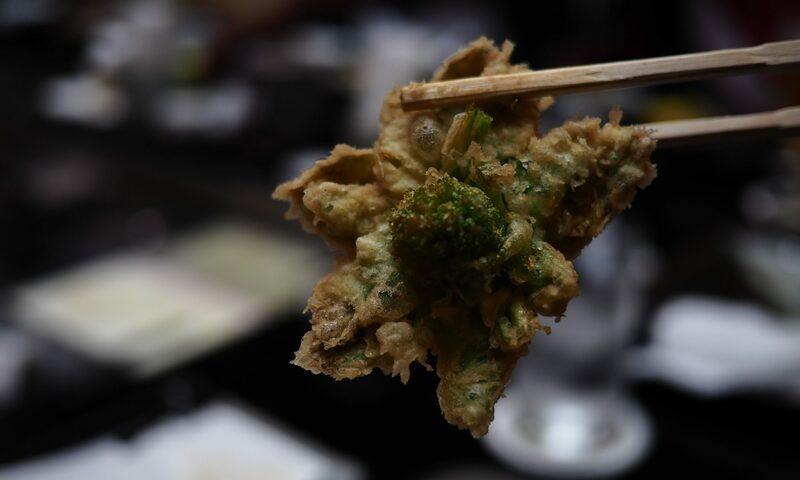 A starter section offers a number of non-sushi options, including an exceptionally good Agedashi Tofu (tofu in a thin, crisp rice-flour coating and a dashi sauce), a flavourful beef rib in a teriyaki-type glossy sauce, and these oyster shooters. 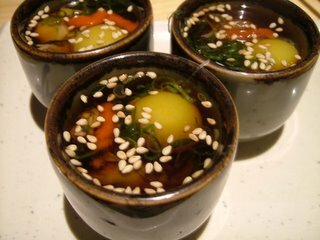 Each little sake cup contains a shucked oyster and its juices, a little rice wine vinegar, a raw quail egg, spring onion, toasted sesame seeds and chilis. It’s a rich and flavourful mouthful, to be tipped straight from the cup onto a waiting tongue and tasted thoughtfully. Although we visited a slightly embarrassing four times in two weeks, we didn’t get to the section on the menu with the hot main courses; the sushi is so good that to miss an opportunity to try it would be a real pity. 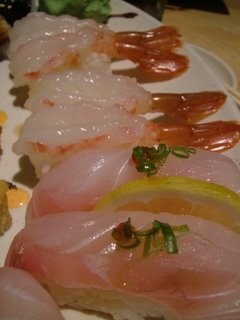 Here you can see some red snapper (in the front of the picture) and Amaebi (sweet prawns) Nigiri. The sushi here is seasoned minutely, to a degree where extra wasabi and soy is barely necessary; each different kind of fish has been prepared with a slightly different seasoning. This snapper takes on a very little flavour from the rind of the lemon separating it, and is adorned with a tiny dab of chili and some of the green part of a spring onion. This chili also makes a perfectly balanced appearance on the albacore tuna Nigiri. The Amaebi Nigiri is accompanied by the heads of the raw prawns. The heads are deep-fried until so crisp that the whole thing, eyes, beak and all, is edible. They are served with a piece of lemon to squeeze over, and if you are lucky, the people you are eating with will be too squeamish to eat them so you can gobble the lot yourself. Samurai is on the California side of the lake, so California rolls are mandatory. There’s a large selection of Maki rolls and other, more American offerings. 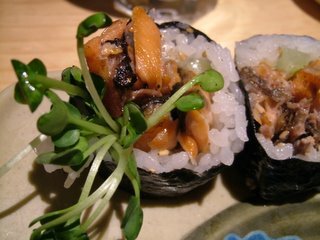 The salmon skin rolls (with what I think are alfalfa sprouts – any alfalfa-familiar readers who can identify these for sure are invited to comment) are crisp and smokily delicious. House rolls from the large selection on offer – not at present visible on the restaurant’s website – are really, really well worth sampling. The Crabby Crabbington showcases the local King Crab leg with soft-shelled crabs; my favourite, the Crouching Tiger (the bottom roll on the right), is filled with crab and other good things, covered in a tempura batter, then wreathed in prawns and Unagi (more about that later) and its sauce. Above the Crouching Tiger roll you can see Mr Weasel’s favourite, a J-Lo roll, full of avocado, crab and a spiced raw tuna. Fights broke out each time we visited over which rolls to select. Visit with someone of a gentle nature in order to get exactly what you want. Uni (sea urchin) was firm, sweet and tasted of the sea. Exactly right and beautifully fresh (it’s so disappointingly easy to find restaurants serving ancient, stale Uni, as I did a few months ago). 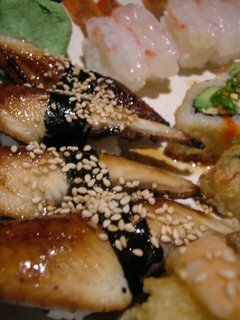 Finally, the Unagi (crisply grilled freshwater eel) here is the very best I’ve tried anywhere. You can watch it being grilled fresh at the sushi bar, and it arrives on your plate hot and crackling. The eel is selected carefully here for a fatty layer beneath the skin which will create that crisp finish when heated quickly. 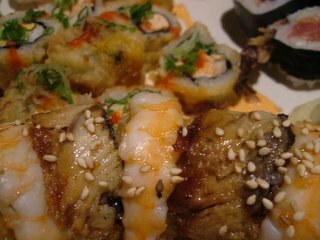 The meat is tender and sweet, and the sauce which is brushed across the top is delicate, finishing the sushi perfectly. If you get the chance to visit, order adventurously. Try the items on the menu you think you don’t like – you may just never have had them fresh before. If you’re staying in one of the many Stateline hotels, you’ll need to drive or take a cab – the restaurant is about four miles into California, and hopefully you will be too full to walk that distance by the time they’ve finished with you. Only another year to go. Hello! I am a lurker. Loved your sushi descriptions. I’ve never really had sushi properly, that looks seriously tempting. I’m not far from Cambridge, any good places of that ilk there? the food looks so delicious! especially the shrimp sushi. i’m salivating now. by the way, your fridge (a few posts down) is awesome. Teri-yaki on the quayside in Cambridge is the only Japanese restaurant for miles around – I couldn’t recommend it wholeheartedly, though. 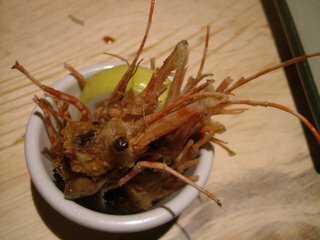 I remember a particularly nasty moment with some prawn sashimi which was sort of . . . soft and flossy. In the UK you’re really best off going to London. My favourite sushi place here is Ikkyu on Tottenham Court Road (Goodge St is the nearest tube station). It’s not as good as Samurai, but it’s well worth a visit, and a train ticket is much cheaper than the air fare to California. That looks like incredible sushi. I have missed your posts during your vacation and am so glad to see you back! As for the sprouts, they are snow pea sprouts. I am now extremely hungry and am going to demand that we go out for sush (as I like to call it) later tonight. We have great sushi here in Anchorage, too. That stuff looks excellent, though. I’ve been following your weblog for a while and love your photographs. They make me very, very hungry. Congrats on your 100th post! 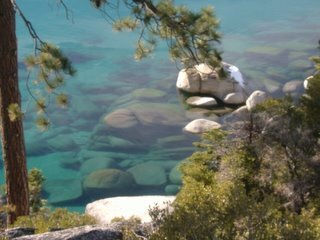 I love Lake Tahoe and I’m glad you liked it, I’m going in a couple of weeks and I’ll try to drag everyone to the sushi place! I was living in bishops stortford for a few years and the lure of california drew me to San Diego, so its nice to get a taste of home with your blog. Came by for your panna cotta recipe, checked out a few more of your recipes while I’m here. Previous PostPrevious Back from holiday – new fridge!